I’m sure that readers can add their own post-truths to this list. Of course, at some workplaces, many of these statements actually apply. But in too many places of employment, the more you hear them, the less truth they happen to carry. On occasion I receive inquiries that go something like this: I’ve been a target of workplace bullying. I’ve learned a lot from this experience and want to help make sure that others don’t go through what I did. In fact, I’d like to do some work in this area. How can I go about this? Typically such inquiries come from folks who would like to be more deeply involved in public education, consulting and coaching, and advocacy work about workplace bullying. They run the gamut of professional backgrounds and age ranges. Although I’ve written about how people can respond to workplace bullying as individual activists, I haven’t fully explored this question for those who want to pursue a vocation or serious avocation in this realm. For purposes of discussing possible roles, I will use the term “subject matter expert” (SME), the specifics of which, of course, will vary with individual circumstances and interests. The transition from workplace bullying target to SME is a challenging one. Some who want to make this transition proceed under two misconceptions. First, they overgeneralize from their experience, sometimes to the point of regarding themselves as an expert on workplace bullying because of what they endured. The experience of being bullied at work may yield many valuable (albeit very difficult) lessons that can benefit others. But one’s own experience of work abuse is not necessarily universal or even representative. Variations on bullying are seemingly endless. Thus, I wince when I read or hear bullying targets offering what I believe is questionable advice, drawn largely from their own experiences. Second, some targets seeking to transition into SME roles may enter the fray when their own bullying experiences are still too raw. Emotionally, they aren’t ready. Perhaps they will never be, and there is no shame in that. Some are empowered by becoming change agents regarding bullying at work; others are re-traumatized. My observation is that those who use their experiences as their primary “texts” for understanding bullying at work and who dive into various SME roles before they’re ready may give bad guidance and advice to others, may overlook evidence-based findings about workplace bullying, and may embroil themselves in an emotional stew that consumes them from the inside. Sheila M. Keegan, The Psychology of Fear in Organizations (2015). Some may benefit from or need more formal training and education, including the possibility of an advanced degree or certification in fields such as psychology (clinical, social, or industrial/organizational), social work, coaching, business management, human resources, labor studies, or law. As I’ve suggested above, you need to be able to step out of the emotions of your own experience. That’s not easy. Workplace bullying can seep into the bones. All too often, I’ve seen people jump into this arena, only to discover that they’re still too close to their own experiences. Especially if a counselor or therapist recommends that you’re not ready, it would be wise to heed that advice. Also, you need to identify where you can make your contribution. Those who seek an avocational role may want to engage in activism and advocacy, social media outreach, and public education work. Many who support the anti-bullying Healthy Workplace Bill are involved in these ways. For those who seek a more vocational focus — in other words, to earn a living addressing these behaviors — it usually will be necessary to pursue work in a given profession. Formal, advanced training in one of the fields suggested above may be appropriate. For some time I’ve wanted to explore more deeply the work of Dr. Brené Brown, one of the most interesting thinkers and writers around today. Her work on courage, vulnerability, and bouncing back from life’s setbacks is very intriguing to me. I’m looking forward to this course! It feeds the lifelong learning junkie in me, and I’m sure that I’ll gain some insights worthy of sharing with readers of this blog as well. 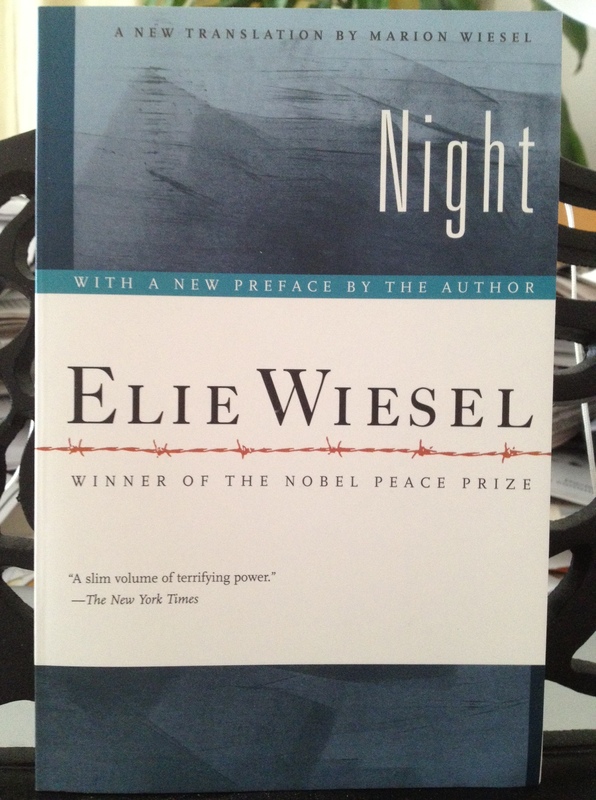 Over the weekend I read Elie Wiesel’s Night (1958; new translation 2006), a defining personal account of life and death in Nazi concentration camps. Even with a Preface, Foreword, and Wiesel’s 1986 Nobel Peace Prize acceptance speech included, the book comes out to less than 150 pages, so this hardly counts as a reading marathon. Nevertheless, my intention was to start it on Saturday evening and to finish over the coming days. But once I began reading, I kept going until reaching the end early Sunday morning. As an amateur student of history, I’ve read a lot of books and watched many films and documentaries about the World War II era, including the Holocaust. However, what should’ve been so self-evident to me beforehand finally sank in as I read Night: We need to understand the Holocaust because there is no more documented, memorialized, and analyzed chapter of widespread, deliberate, orchestrated human atrocity in our history. If we want to grasp how human beings in a “modern” era can inflict horrific cruelties on others — systematically and interpersonally — then the Holocaust is at the core of our understanding. I know there are many other episodes of genocide and oppression that we must consider. The Armenian Genocide of 1915. Rwanda in 1994. America’s history with slaves and Native Americans. The list goes on. But for a variety of reasons, the scale and driving hatred of the Holocaust, and the body of remembrance, documentation, and interpretation about it, are singular. Allusions to the Holocaust, Nazis, Hitler, and the like must be offered carefully. This includes discussions involving employee relations. Even terrible workplaces are not concentration camps. But I respectfully suggest that these comparisons are important and useful when severe workplace bullying and abuse are under examination. Barbara Coloroso is an internationally recognized authority on school bullying whose work also has extended into the general realm of human rights. She recounts in her 2007 book Extraordinary Evil: A Short Walk to Genocide how she used a talk at the University of Rwanda to explain “how it was a short walk from schoolyard bullying to criminal bullying (hate crime) to genocide,” invoking the roles of aggressor, bullying target, and bystander. “Bullying is the dehumanizing of other human beings with intent to harm,” Coloroso said yesterday during her third talk in South Hadley. Coloroso, who did work in Rwanda during the mass genocide, explained that genocide “dehumanizes” people in the same way bullying does to “targeted” children. Coloroso then explained that bullying, like genocide, cannot be resolved through conflict resolution. Kenneth Westhues, the University of Waterloo sociologist whose case studies of mobbing in academe are worth the concentrated study of any serious student of workplace abuse, uses the term “elimination” to describe the process of removing targeted professors from their jobs. Ken also draws comparisons between severe mobbing behaviors at work and perpetrators of larger-scale eliminations and genocides, including the Nazis. Philosopher Hannah Arendt invoked the phrase “banality of evil” to describe how Adolf Eichmann served as one of Hitler’s architects of the Holocaust. Since then, the phrase has come to represent — in more generic terms — how ordinary people become easily invested in the values of a morally bankrupt status quo and participate in terrible behaviors that seemingly are unthinkable in civilized society. These insights teach us a lot about how bureaucratic enablers of abusive bosses can help to facilitate the destruction of a bullying target. These professional handmaidens (usually HR folks and employment lawyers) are more than simple bystanders; rather, they are complicit in the abuse. Let’s start with…puppet master bullying. In these situations, a chief aggressor’s power and influence over a group of subordinates may be sufficient to enlist their participation in mistreating a target, creating what looks and feels like a mob. For example, if the aggressor is a mid-level manager, he may recruit HR to help out with the dirty work and encourage the target’s peers to shun or bully her. …By contrast, genuine workplace mobbing occurs when the malicious energy is shared among the many, who proceed to go after the few. It may have started as puppet master bullying, but regardless of its origins, this is now a mob, with individuals owning that animus in ways that fuel each other’s antipathy toward the target. In cases of puppet master bullying, removal of the “master” has a dramatic effect: “Typically, much of the malicious energy that fueled the puppets fades away, and so with it much of the bullying behavior.” Surely conditions in Nazi Germany help us to understand this line between bullying and mobbing, even though the behaviors differ significantly in scale and impact. Wiesel experienced Nazi concentration camps as a teenaged boy, yet the stories he shares do not require a more mature moderator beyond the author’s voice. In Night you will see extreme cruelty, calculated psychological terror, bystander inaction, the breakdown of civility and society, and willful ignorance and denial, along with acts of kindness, love, bravery, and self-sacrifice. It is good that this book is a short one; anything more might be overwhelming. In any case, Night is definitely worth the time of anyone who wants to understand how the extreme realms of cruelty exist in modern society, in small and large ways. I wish that I could say that our workplaces are free of such behaviors, but that would not be true. Duffy & Sperry on the organizational life cycle: When the wheels are coming off, do bullying/mobbing behaviors follow? It’s Stage V, Early Bureaucratization, where serious organizational problems start to arise. Status seeking and turf wars become common. As negativity builds, the better workers start to leave. Leadership morphs into poor administration, and passive-aggressive behaviors increase while morale decreases. How does this relate to bullying and mobbing at work? I suggest that you spend some time with this excellent book to see how the authors relate this life cycle to bullying and mobbing behaviors at work, but we can also ponder the question here. We have known for a long time that interpersonal abuse at work is usually enabled by an organization’s culture. The Duffy-Sperry conceptualization of the organizational life cycle helps to clarify when these behaviors may become more frequent, especially varieties of mobbing that are focal points for their work. Over the years, I’ve heard many descriptions of workplace cultures associated with bullying & mobbing that seem to correlate with the Early and Late Bureaucratization stages described by the authors. Status-seeking, turf wars, dropping morale, poor leadership, passive-aggressive behaviors, lousy communication, self-protective and play-it-safe strategies…the list goes on and on. Bullying behaviors thrive in such institutional settings. Fixing such a toxic work environment calls for wise, inclusive, and open-minded stewardship — very likely the opposite of the brands of “leadership” that brought the organization to its crisis point in the first place. I’m curious if readers recognize these latter stages of the organizational life cycle in bullying & mobbing situations they’ve experienced or observed.